I’ve actually smoked several of these, but I have never posted about them. I believe that my #5 slot has been taken by this cigar. 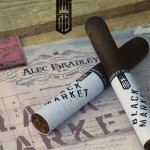 The Black Market is a fantastic smoke by Alec Bradley. Found many times on the Daily Joe’s Deal, I’ve picked up several 5-packs since last December, which is when I first discovered this smoke. I tasted some creamy flavors along with an earthy blend. Hints of a woody taste finishes off the smoke. It sounds like a common flavor, but the Black Market has a unique taste that I couldn’t quite pinpoint. I will have to smoke a couple more of them to try and pull out more flavor.